NEW ORLEANS (AP) — A federal judge presiding over litigation spawned by the massive Gulf of Mexico oil spill has dismissed all claims against the manufacturer of a chemical dispersant that was used to break up crude gushing from BP’s blown-out well. U.S. District Judge Carl Barbier ruled last week that federal laws shield Illinois-based Nalco Co. from liability over the government’s use of Corexit after the 2010 spill. Nalco didn’t decide whether, when, where, how or in what quantities Corexit would be used in response to the spill, Barbier noted. And the judge said it wouldn’t be proper for him to second guess the federal on-scene coordinator’s decision to use the dispersant. Lawyers for cleanup workers and coastal residents exposed to the dispersant had argued Nalco isn’t immune from claims it supplied a defective product that wasn’t safe for use in the Gulf. But the judge said the claims would create an “obstacle to federal law” if he allowed them to proceed. More than 1.8 million gallons of dispersant were used in responding to the spill. It was last used four days after BP capped the well in June 2010. A 2010 study by the Environmental Protection Agency found that Corexit, when mixed with oil, is no more toxic to aquatic life than oil alone. But congressional investigators have claimed the U.S. Coast Guard defied a federal directive to use the chemical sparingly and routinely approved BP requests to use thousands of gallons of Corexit per day. BP has agreed to pay the largest criminal fine in US history – $4.5bn – to resolve all criminal charges arising from the fatal oil rig explosion and catastrophic oil spill in the Gulf of Mexico. The company said on Thursday that it had agreed to pay $4bn to the US government over five years, and $525m to the Securities and Exchange Commission. That money will be paid over three years. 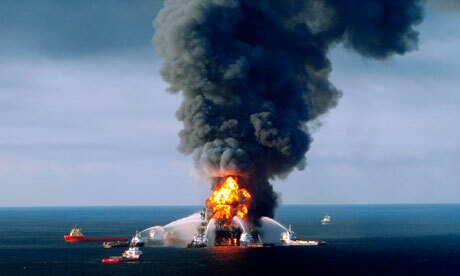 The criminal settlement does not settle all of the claims against BP for the April 2010 blowout of the Deepwater Horizon, and the subsequent oil spill. The oil giant is not yet off the hook for environmental damage to the Gulf of Mexico, and could face billions in restoration costs to waters, coastline and marine life. But Thursday’s deal does limit BP’s exposure to further criminal charges and penalties, and frees the company to focus on resolving those other civil claims. The fine is the largest criminal penalty in US history, easily outstripping the previous record of $1.2bn levied by the Justice Department against drug giant Pfizer over fraudulent marketing practices. In addition to the fines, the oil company agreed to plead guilty to 11 felony counts of misconduct or neglect of ships’ officers, arising from the deaths aboard the Deepwater Horizon when the rig exploded and sank. It also agreed to single misdemeanour counts under the Clean Water Act and the Migratory Bird Act and one felony count of obstruction of Congress. The settlement remains subject to US federal court approval. “All of us at BP deeply regret the tragic loss of life caused by the Deepwater Horizon accident as well as the impact of the spill on the Gulf coast region,” BP’s chief executive, Bob Dudley, said in a statement. The company’s chairman, Carl-Henric Svanberg, said BP believed the settlement was in the company’s best interests. In London the company’s shares, which had stopped trading before the news of the fine broke, closed down a fraction of a penny at 425.4p. So far, the company has set aside $38.1bn to settle claims and fines related to the disaster. The Justice Department is expected to issue a statement on the settlement later on Thursday. It was expected that a number of BP executives and managers, including those working on the rig the night of the explosion, would be charged. All but one of the 14 criminal charges announced on Thursday relate to the night of the explosion aboard the Deepwater Horizon, and are based on the negligent misinterpretation of the negative pressure tests performed on the well. A number of the investigations into the disaster have homed in on the final hours before the rig explosion, when engineers tried and abandoned different plans to finish off the well. The final criminal count arises from statements BP officials made to a closed session of Congress about how much oil was gushing from its stricken well. The company is accused of deliberately underestimating the flow-rate – which experts say compromised efforts to cap the well. 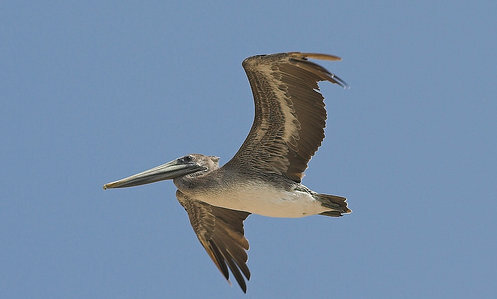 It was not immediately clear how BP’s plea would affect its operations in the Gulf. The oil company remains one of the major players in deepwater drilling in the Gulf of Mexico. BP said it was not aware of any government actions to suspend or curtail its activities in the Gulf, as a result of the settlement. The settlement could also clear the way for the justice department to come to a plea deal with BP’s partners on the doomed well: Transocean, which owned the rig, and Halliburton, which cemented the well. 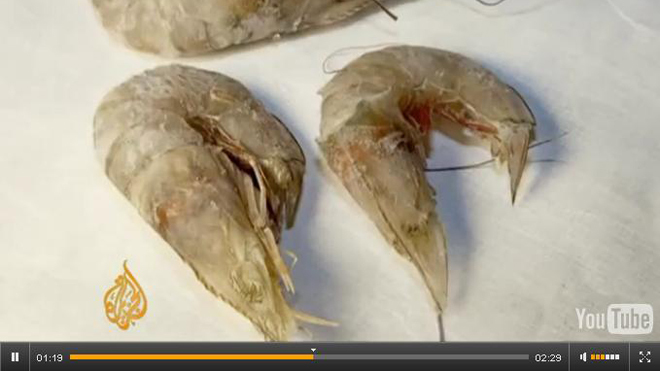 “At the height of the last white shrimp season, in September, one of our friends caught 400 pounds of these,” Tracy Kuhns, a commercial fisher from Barataria, La., told Al Jazeera, showing a sample of the eyeless shrimp. Scientists blamed the mutations on the polycyclic aromatic hydrocarbons (PAHs) released from the spill’s submerged oil as well as the two million gallons of the dispersant Corexit that BP used in an attempt to clean up the spill. The program uses newly developed UV light equipment to detect tar product and reveal where it is buried in many beach areas and also where it still remains on the surface in the shoreline plunge step area. The tar product samples are then analyzed…to determine which toxins may be present and at what concentrations. By returning to locations several times over the past year and analyzing samples, we’ve been able to determine that PAH concentrations in most locations are not degrading as hoped for and expected. 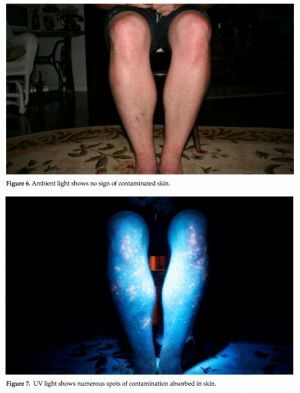 Worse, the toxins in this unholy mix of Corexit and crude actually penetrate wet skin faster than dry skin (photos above)—the author describes it as the equivalent of a built-in accelerant—though you’d never know it unless you happened to look under fluorescent light in the 370nm spectrum. The stuff can’t be wiped off. It’s absorbed into the skin. The use of Corexit is inhibiting the microbial degradation of hydrocarbons in the crude oil and has enabled concentrations of the organic pollutants known as PAH to stay above levels considered carcinogenic by the NIH and OSHA. 26 of 32 sampling sites in Florida and Alabama had PAH concentrations exceeding safe limits. Only three locations were found free of PAH contamination. Carcinogenic PAH compounds from the toxic tar are concentrating in surface layers of the beach and from there leaching into lower layers of beach sediment. This could potentially lead to contamination of groundwater sources. The full Surfrider Foundation report by James H. “Rip” Kirby III, of the University of South Florida is open-access online here.